And a very special Thanks to our Supporting Sponsor Susan Zelenko of Berkshire Hathaway HomeServices: The Preferred Realty. Your donations are helping us continue our programming and bring new sports to youth in Edgewood. Thank you! registration forms and deadline announcements. Wooden Bat Baseball has not been able to continue due to lack of interest. If you would like to join a baseball team, we do offer Tball for boys and girls ages 5-7, and Softball for girls ages 7-14. See below on this page for more information. There are also other baseball leagues in our area, such as the Wilkinsburg Baseball Association in Wilkinsburg and 14th Ward Baseball in Squirrel Hill. Click Here to register for these great summer leagues! Registration is open to May 15. Girls' Softball for girls ages 7-14. Registration begins April 15 and ends May 15. Games and practices are through June & July at Koenig Field. This fantastic summer sport is a star every year! Registration fee is $50. There is no need to be an Edgewood Resident to play. Click Here to read the FAQ Sheet. Call Jessica at 412-242-4824 or email office@edgewoodboro.com with any questions. T-Ball is for girls and boys aged 5-7. Registration begins April 15 and ends May 15. Games and practices are held through June & July at Koenig Field in Edgewood. 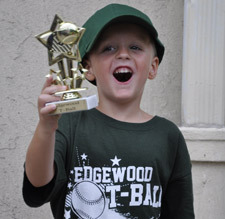 Summer Tball is a great way to stay active, and parents and kids love this sport. Registration fee is $50. There is no need to be an Edgewood Resident to play. Youth Soccer is open to girls and boys ages 4-14. Registration begins July 6 and ends the second Monday in August. Games and practices are through September and October at Koenig Field. There is no need to be an Edgewood Resident to play. Registration fee is $65. 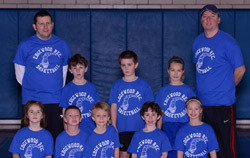 Men's Basketball plays Thursday nights at Edgewood Primary School Gym starting December. If you have any questions about the program, please call George Fuller at 412-247-1472. Click Here for the Registration form. Yoga in the Park runs spring-fall at Koenig Field. Keep active while centering yourself outside. These classes run in 6 or 5 week sessions, and you can feel free to drop in when the class is in session. Be sure to wear loose-fitting, comfortable clothing and bring your own yoga mat. If you’re dropping in to the session, be sure to come 15 minutes early to fill out the registration form. This class is for adults ages 18 and over. You can pre-register for all classes or pay per class. Follow our Facebook page for announcements. We hope it will be a peaceful evening for your mid-week! Namaste! Jon Wilson leads this class Mondays from 7:30-8:30pm March 11 – April 29. Be sure to arrive 15 minutes early to complete your registration form if you are dropping in. Click Here for the registration form. (Pre-registration ends March 11. This class is for adults 18 and over.